Manage time and attendance by exception with ease. Clocks are schedule “aware” and all actuals flow back into the schedule for reporting. Managing time & attendance becomes a fast and simple task for managers. Highlight the exceptions to the schedule for quick solutions. The Time Manager module provides a comprehensive Time & Attendance solution. Time Manager will integrate seamlessly with our time clocks (or yours) to provide a complete linkage between scheduling and time & attendance. Through a very simple, color-coded web page managers will be presented with any events that are exceptions to the schedule e.g. the team member has not clocked in or has clocked in outside agreed grace periods. Time Manager will enable your managers to “MANAGE BY EXCEPTION” freeing up valuable time to take care of their team members and customers. Streamline the payroll process and reduce payroll errors with automatically calculated penalties, loadings, overtime and allowances. Would you like your scheduling system to automatically convert timesheet information into a file for your payroll system? If you answered “yes” to the question above then you need our Award Interpreter module! Award Interpreter makes the job of taking employees’ timesheets and working out how to pay them a thing of the past. Capable of calculating penalties, loadings, overtime (daily, weekly, bi-weekly or monthly) and allowances – Award Interpreter is a powerful module that uses scheduled and actual information (time clock data) to generate an accurate costing automatically. We have clients with over 10,000 employees on the one site using Award Interpreter to generate a payroll file to the exact requirements of their payroll system. Save time, save money and reduce errors using Award Interpreter. Smarter, faster, smaller and better value than the competition. Upgrade your time & attendance. 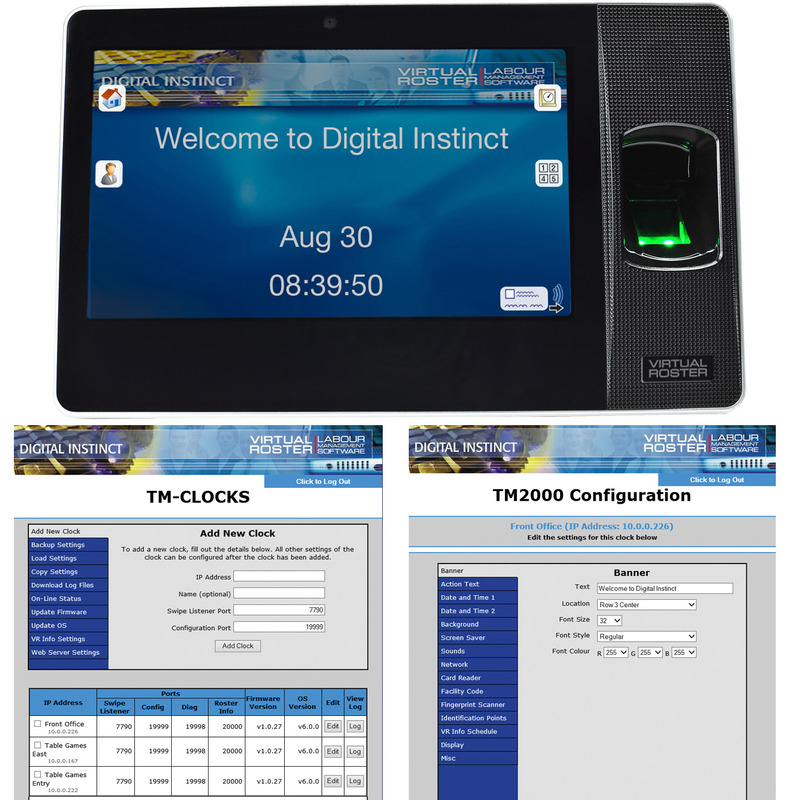 The TM2000 Time Clock is a multi-media time capture terminal featuring a 7 inch LCD touch screen, running Windows CE with an Intel 32 bit compatible processor. Each clock is highly configurable allowing the casino resort to display corporate branding, messages, today’s work location and the employee’s next 2 shifts. A number of daily operational changes can also be actioned directly through the clock including role changes and location changes. Proximity Card and / or Biometric options are available. With up to 2 GB of non-volatile storage and embedded battery backup the TM2000 is an advanced and reliable time capture device.